functionality into separate modules, and by using unity we can decide easily plug and unplug functionality. If you haven’t heard about Chain of Responsibility pattern see http://en.wikipedia.org/wiki/Chain-of-responsibility_pattern, on the other hand, if you haven’t heard about Microsoft Unity 2 Block (an IoC or dependency injection framework, please check http://unity.codeplex.com/. Now, lets get started with a simple sample. 2. In our sample, the application uses repositories, to get and store user data. Our sample has create a project per layer, and these projects communicate by implementing the interfaces (contracts) from the Infrastructure project. Lets see some notes about each layer. “Data” project will retrieve real data from the data base. “Dummy” project will produce dummy data. “Cache” project will perform cache tasks, and then delegate the data retrival tasks to a given sucessor. “Logging” project will perform logging tasks, and then delegate the data retrival to a give successor. “Infrastructure” project will define the interface that is required for the UserRepository. So all projects knows what is the expected input and output for the UserRepository. Additionally it has been define a ISuccessor interface in order to identify layers that require a successor (for example Logging, Cache). 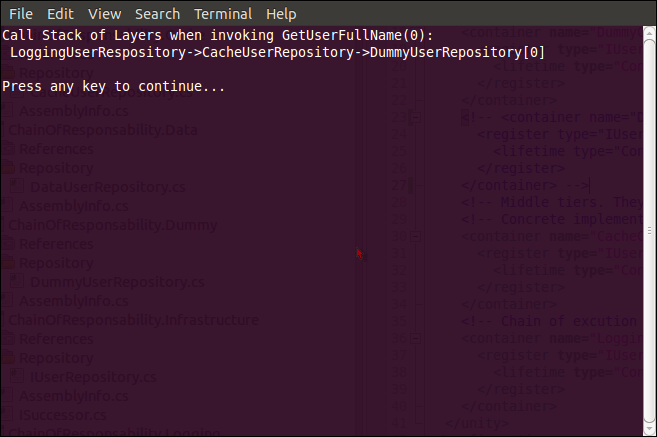 For the sake of the sample, the IUserRepository defines only one operation GetUserFullName. In this opertion, each implementation will add a text indicating that it has been performed a call to each given layer. By using unity 2 we will be able to indicate which levels will be loaded and executed through a configuration file. This code is sample of the contract that each different layer is going to implement if they want to be part of the chain for IUserRepository. This generic interface allows to indicate a successor to perform the next call in the chain. 3. The “Logging” and “Cache” projects will implement IUserRepository and ISuccessor interfaces, and additionally they will require the successor as parameter of the constructor in order to delegate the task itself. Because of Unity 2 can only resolve one (anonymous) mapping for a given type (always into the same container). My colleague Marvin (aka Murven ) suggested a workaround. Basically, each layer which implements ISuccessor will receive in its constructor the IUnityContainer which will resolve the contract, but instead of using the given container, it will use the parent to resolve the type. So, it could get a different resolution for the same given type. Even though both files owns a similar structure, each file can add a very specific functionality (caching or logging) in the previous example, and the invoke the proper successor. 4. The “Data” and “Dummy” projects will implement IUserRepository only and they will implement the task itself. In the case of “Data” and “Dummy” layers, they don’t need a successor so they can perform the task itself and return the proper result. 6. There is an additional step, which is to load all the containers from the configuration file. Basically it’s done by looping through all the containers and asking for a new child on each iteration. So, we can create a sort of chain of containers where each one owns a different type resolution for the save given type. I’ve created an small utility which load the different containers and create a chain (container and parents). “The type name or alias …. could not be resolved. Please check your configuration file and verify this type name.” Assuming that you’ve written correctly all the types and DLLs names, then this error appears because the application couldn’t find the DLLs required to load the specified type. So, remember to copy the DLLs when running the application. And we can replace the “Data” layer with the “Dummy” layer just by commenting the “Data” layer definition into the configuration file. // perform some operations using the myConn instance. At very first sight we might thing it’s flexible enough,… however it’s not as flexible as we might think. The only thing we can change is the connection string ( which only works for Sql Connections). We cannot specify a new data source e.g. MySql, SysBase, or a XML feed. So, is it really flexible? This approach seems to solve our dependency problem, however we still kinda of tight to the SqlConnection, we can argue that all the layers build over this Connection class, might depend of the SqlConnection class. So, in fact if we would like to create tests, we will need to specify a SqlConnection to use our Connection class in middle layers. This might be painful if you consider that you’d like to create unit tests where each test will depend of the connection, instead of having more specific data sources to perform accurate tests. In the previous example, it’s possible to take advance of the all the functionality provided by the connection without knowing if it’s a SqlConnection, MySqlConnection or even a XmlFile. The functionality is exposed by the contract, and we receive by parameter the implementation that has to be used by the class. This makes the User class depend on the contract instead of the concrete implementation of the contract. Certainly this model makes appear a new issue. In a supeior level of our structure the concrete implementation has to be instanciated, and this in fact is what makes our code less flexible. // ... so... where does the concrete implementation of User come from? In this example, the Creator class knows which concrete implementation of IConnection should used in the instantiation of User. This could be specified in a configuration file, or by code. This process of providing instances and injecting its dependencies is known dependency injection. Currently there are several frameworks that allows users to handle the instantiation of the objects in the application. So, for changing an implementation for the entire application it might be as easy as change a setting in a configuration file, and provide a concrete implementation. Composite application uses as Microsoft Unity to implement Dependency Injection. Even though the Unity library is already included with Prism, it’s optional to use it. Also, It’s possible to use other Dependency Injection framework, such as Microsoft Extensibility Framework (aka. MEF) which also is provided by Microsoft.